There’s a new blog that I’ve been following these last few weeks that has provided some great interaction on a number of topics within the Assemblies of God fellowship leading up to our biennial General Council next week. On that blog, a few people have posted comments eluding to their dissatisfaction with the A/G and desire to possibly step away from the fellowship. With that in mind, I wanted to do a few posts on a core value I hold to – Always being connected with something greater than myself. 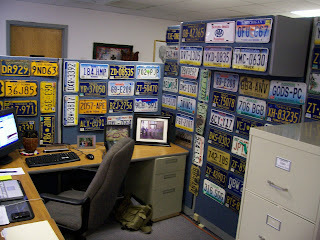 When I was in college I began a collecting license plates. It’s kind of a cool thing to collect because now I have all these old plates from 19 different states and 2 countries. One thing that is pretty cool about this collection, though, is that I’ve never paid for a single one. (And no I haven’t stolen them either!) They have all been given to me. I displayed them in my dorm room in college and now in my office. As people walk in and see them they often say, “Hey I have a license plate from such and such. Do you want it?” That’s how the collection has grown. What I’m getting at is all these license plates were once in the hands of individuals. Whatever value they had, it is now greater. Why? Because they are apart of a collection. The grouping of them together adds value to them. In our lives our natural tendency is to be independent – a renegade winning this world for Christ on our own. But to be truly effective we need to be connected with something greater. Yeah, of course we need to have a connection with God, but I’m talking about being connected to a church, organization, or something of that sort. Because when we are connected to something greater it does four things. It provides value, support, accountability and momentum. Our talents and abilities grouped together with others will do far more for the kingdom of God than we could ever do on our own. We will all face stretching moments and experience failure at some point in our lives. At these moments we need encouragement, advice and support. To go through life apart from accountability is not only stupid, but destined for destruction. We will only live up to the standards we are held accountable for! Momentum is something that is difficult to get started, but even more difficult to sustain. Being connected to something greater enables us the resources, but also the affirmation to keep going. Good stuff, Nick. One of the biggest mistakes that people make in ministry is being the Lone Ranger. We need each other and we are working for the same God and goal. And that needs to be our driving force!